As we wrap up the second week of kindergarten, we are still adjusting to the earlier wake-up time. I had to wake up two cranky little girls this morning because they kept talking last night instead of going to sleep. Being the mean horrible mother that I am, I make them get dressed, shoes on and hair brushed before they can eat breakfast. I figure they can always eat while we walk to school. I knew today was going to be a battle, but was prepared for it. I was brushing the Big One’s hair while the Little One was putting on her shoes. She still struggles with getting the right one on the right foot and the left one on the left foot. So she asked me if she was working on the correct foot. Glancing up, I tell her yes she had it right. I finished brushing the Big One’s hair and was getting my shoes on when I noticed the Little One had a shoe on the wrong foot, so I told her she needed to switch feet. I admit I was a little confused because I saw her putting one shoe on just a minute ago and it was right. So she seemed to switch shoes and asked me again if they were right. I looked at her left foot and noticed it was on the wrong foot. So I told her she still had them wrong. She let out an exasperated groan and took her shoes off again to switch them. We were running late for school when the incident occured, further evidence of my level of tired-ness is proven here when I tried to re-enact what happened and put two left shoes on her! Now I am a little tired too this morning, so it took my brain a little while to process what was happening. The Little One can be quite the jokester, so I initially thought she was messing with me and not really switching shoes. 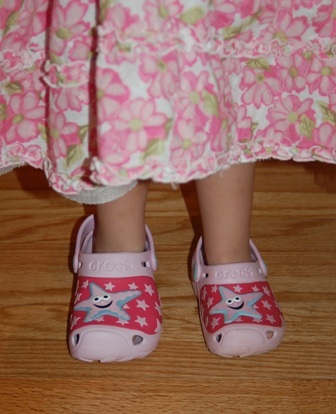 Then it dawned on me that the Big One and Little One have matching Crocs and the reason the shoes seemed to be on the wrong feet is that I was always looking at her left foot, and she was wearing two right shoes – one was hers and one was the Big One’s. So my lesson for the day, either choose to look at both feet or stop buying matching shoes!